Bach Rescue Remedy for Pets - Alcohol Free are a 100% natural remedy that provides quick relief in situations of stress and tension. They are suitable for all pets. Bach Rescue Remedy for Pets are a 100% natural remedy that provides quick relief in situations of stress and tension. 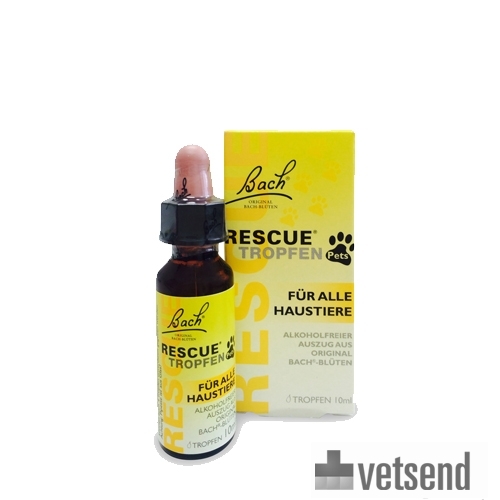 These pet drops from Bach Rescue are ready to use for tension and/or stress. Bach Rescue Remedy for Pets can be used immediately in case of restlessness and/or stressful situations. The drops safely comfort the animal and make it feel relaxed. Bach Rescue Remedy for Pets, like other products from Bach Rescue, contain the five flower remedies of the Original Bach Flower formula. Suitable for all (domestic) animals. Add the drops to drinking water or mix with food. Some animals do not drink often and will not get the drops regularly enough to benefit. In this case, use a mixing bottle. If there is no water available, place 4 drops on the tongue, without the glass dropper touching the tongue. You can also apply to the paws, claws or ears, allowing it to be absorbed through the skin. If necessary, the above dosage can be given four to six times a day. Glycerin, Aqua, Helianthemum Nummularium, Clematis Vitalba, Impatiens Glandulifera, Prunus Cerasifera, Ornithogalum Umbellatum. This product is sourced from a genuine veterinary wholesaler in the EU. Because of this, this item may be delivered in French or German packaging. Please consult the information above with regards to the administration and dosage of this product. Have you used Bach Rescue Remedy for Pets - Alcohol Free before? Let us know what you think about this product. Great product! Really helped my dog during the fireworks season.